TV with Thinus: OPINION. Dear communications minister Yunus Carrim, stop behaving like the evil emperor of the galaxy with digital television in South Africa. OPINION. 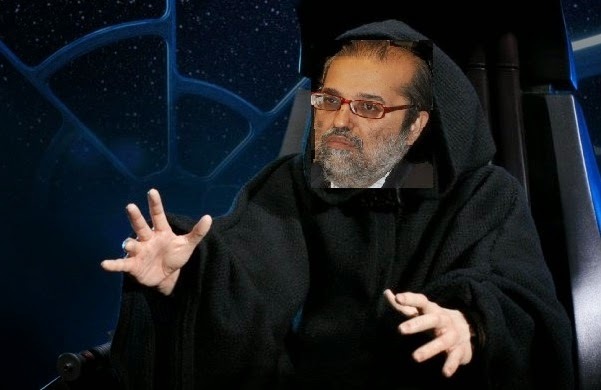 Dear communications minister Yunus Carrim, stop behaving like the evil emperor of the galaxy with digital television in South Africa. South Africa's egotistical minister of communications Yunus Carrim appears to not want public debate on the country's long-stalled switch-over to digital terrestrial television (DTT), and has the audacity to blatantly hint, overtly warn, and admonish groups and organisations that they've "served to substantially weaken the case of those opposed to the government's policy" by simply speaking out about it. Don't forget that these groups and places have existed for far longer than Yunus Carrim has in his position. Instead of congratulating people for the courage of their convictions to speak out, Yunus Carrim appears to want to blast them into submission - and to show others that they better keep quiet. Trash, mister minister Yunus Carrim. Trash. And if the TV industry - which has much more expertise, knowledge and years of experience than you because they actually work with these things and have for years, speaks out in ads and an open letter - and that ad and public appeal weakens their case in your eyes, then really there is something very big wrong with the department of communications and whoever makes decisions regarding DTT. Stop behaving like the emperor of the galaxy minister Yunus Carrim. Unlike that galaxy far, far away, the last time I checked South Africa is/was still a democracy, sir. With freedom of speech and all that, at least on paper. By telling a portion of South Africa's very concerned TV industry - our struggling community TV stations, a pay-TV operator, even an organisation making components used in the industry - that they've weakened their case by simply giving air to their grievances and telling ordinary South Africans where they stand and what they really feel is wrong, you want to SCARE others from speaking up and speaking out. That is wrong and it is called being a bully. I've read the open letter. As the minister of South Africa in charge of a department which has taken more than a decade now to bring our country DTT and still hasn't commercially switched it on, a department lorded over by a former "general" which derailed the process by wanting to change the digital broadcasting standard, and a department which disbanded the Digital Dzonga advisory council (on 1 April April Fools Day no less) not once but twice, you call the stance and the open letter's content's "astonishingly inaccurate". Well, as a journalist who've covered television and the South African TV industry for longer than the terms of the previous FIVE ministers of communications COMBINED, I would call the open letter insightful, important, and filled with real facts made understandable to ordinary consumers, filled with warnings, and something drawing attention to real serious issues. If I were you minister Yunus Carrim, I would not chastise but thank those in the South African TV industry speaking out and speaking directly to South Africa's confused and uninformed consumers and TV viewers. Certainly someone has to, since nobody appears to be speaking to them (I thought the government and the department of communications and a national DTT call centre was supposed to). The flow of information to ordinary people from the government and the department of communications on what DTT is, what it entails, and what the real practical costs are, have certainly not been forthcoming. How much is a set-top box minister Yunus Carrim? Who will decide if I'm poor enough for a subsidy and how, and who decided the income level cut-off and why? Will the SABC be forced to supply the SABC News channel to DStv, StarSat and OpenView HD - what exactly is the rules for must-carry under digital television? Oh wait. There aren't any. Can South Africans buy set-top boxes that adhere to the exact SABS and South African regulatory specifications if it is cheaper but not made in South Africa? When exactly will digital migration start commercially? I can't call the answers to these and multiple more similar questions I have about DTT in South Africa "astonishingly inaccurate" ... because there aren't any. Please stop demonising South Africa's TV industry minister Yunus Carrim. Their interest is the South African TV industry and TV viewers.